I have long respected the talent of actor Denzel Washington despite his appearance in so many films with violent themes, and even though he usually plays noble men. The first time I saw him was in Mira Nair’s 1991 film Mississippi Masala in the role of Demetrius Williams. There and his many superb performances thereafter is why I decided to view Fences http://www.rollingstone.com/movies/reviews/peter-travers-fences-movie-review-w455997. I wanted to hear his consummate voice again. Washington’s familiar timbre is barely recognizable in Fences. But I was not disappointed. As strong as Viola Davis is as his co-star, Washington is outstanding, arguably because he’s able to totally disembody himself and build the complex character of Troy Maxson, the central figure in Fences. That performance stands out for me because I forgot that his skin color and that of the other characters is black. Not only this; I forgot that Troy Maxson is the actor Denzel Washington. In Fences, Troy completely overtakes Washington; moreover, we recognize him as a type of man who to one degree or another we feel we know personally. Troy is a person I know. If you’re familiar with the narrative of Fences, you’ll understand what I mean. 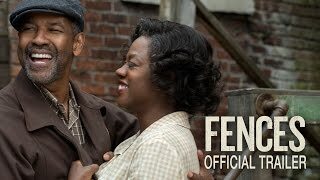 https://www.theguardian.com/film/2017/feb/09/fences-review-denzel-washington-viola-davis. What many reviews overlook is the complexity of the character Maxson, a hard working man, but a man bent, wasted, and embittered. Troy Maxson is a man with unrealized expectations as a baseball player, a father unable to inspire his sons, a brother carrying a shame he cannot hide; he’s a father who does not enjoy the pride he desperately needs. Thanks to Washington’s artistry, we may walk away from the film reflecting on some failure in ourselves or someone close to us, how we manifest our letdown, and perhaps like Troy, inflict hardships on those dear to us. I hadn’t seen this human experience played so powerfully on screen in many years. Few actors can transcend either their race or their celebrity with a performance like Washington gives us in Fences. Which takes me to Moonlight, another outstanding recent film with a full cast of African Americans and centered on a Black American family. Mahershala Ali, best known for his fine performance as the self-serving lobbyist in the televised series House of Cards, was awarded an Oscar for his supporting role in Moonlight. But the real talent there is exhibited by the three actors who play the boy, the teen, and the adult ‘Chiron’ whose painful growth we follow into adulthood. 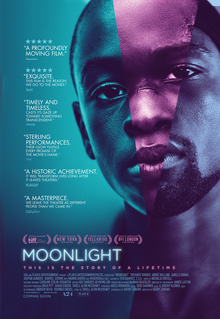 Moonlight is also a story about manhood, about feelings unrealized (labeled by others as a “gay coming of age film”). Beautifully constructed and with restrained, spare dialogue, most of the film seems to be a story about one corner of Black American life. But with the final scene when Chiron, powerfully played by Trevante Rhodes, now transformed into a man, confronts his first love, a childhood friend, it rises to another level. It is a love story, pure and subtle. No race, no class; just two men quietly finding each other. ALSO: listen every Monday morning at 7:45 am for my weekly commentary on WBAI Radio, New York City. Both movie posters above are from Wikipedia.